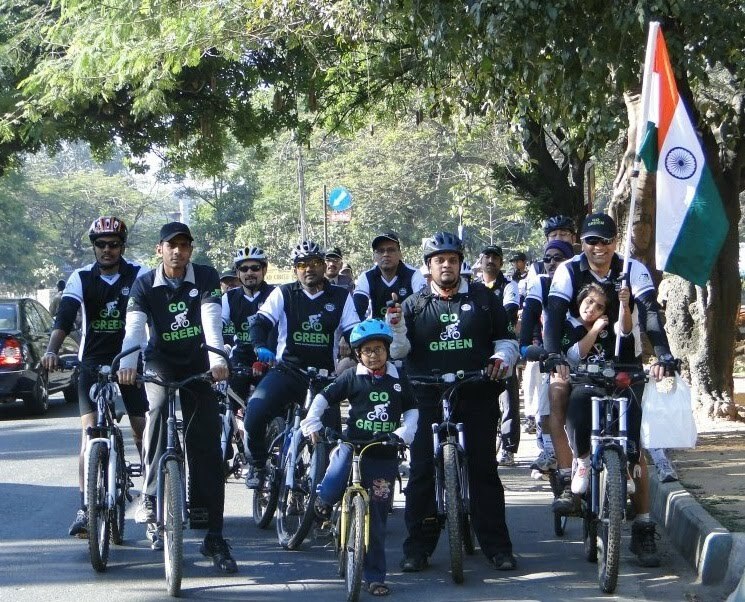 GoGreen Republic day Special Ride 26Jan2012 - GGI-Group size: 4000+ Professionals, Increasing on day to day basis, Come & join us 2 serve Mother Nature. chamrajpet, who not only took up the cost of the breakfast but also presented a memento in recognizing GoGreen for the Green Initiative. 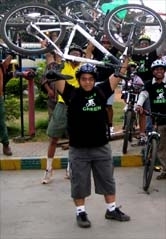 The Ride started @ 7:00am from Jaynagar and reached chamrajpet Uma theater by 7:40am. We had kids riding with us who opted for breakfast first then go on with the ride, one more kid choosed to have breakfast @ Brahimn's Coffee Bar which is located on Shankaramatth road. Iddly,vada & Coffee/tea was ordered for all the participants their after we decided to change our route plan to endup @ Lalbagh flower show. Started from Brahimin's coffee Bar by 8:45am and reached Lalbagh by 9:00am. Due to flower show their was a heavy security added to that it was a paid visit (Rs. 40/person) hence to take all the participants inside was a difficult task. Later decided to get inside with cycles but we were stopped @ the gate were asked to park Cycles outside and then buy tickets. 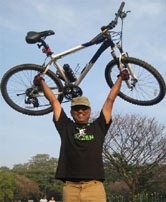 Managed to talk to a director and took permission to take entire group inside Lalbagh @ free of cost that too along with cycles.. We rode our cycles inside lalbagh and stopped near to glass house. Distributed 3rd anniversary memento's to ever riding GoGreen's & finally shared the Memento that was given out by wheelsports. Entered from West gate @ 9:00am and dispersed from main gate by 9:50 am. It was great ride that too riding inside Lalbagh with Indian Flag which made more No of people to turn their head's. 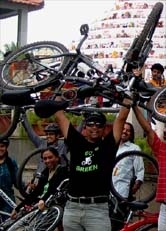 RIS-Junctio - 4th Block Jayanagar -3rd Block- Southend Circle - South end Rd - Naghasandra Circle - DVG Rd - GandhiBazar - Ramakrishna Ashram - Uma Talkies..
Memento from Wheelsports for our GoGreen initiative..